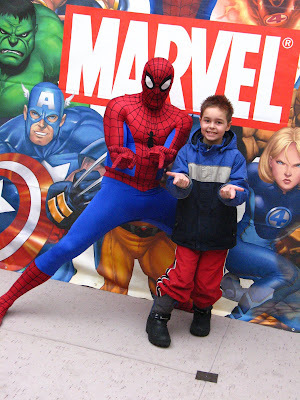 On Saturday, the Winkler police department were sponsoring Spiderman. They'd invited him to come and do a presentation and sign autographs, etc. We waited until Sage was done her nap and then hurried to the Southland Mall. We caught the tail end of his presentation and then got in line. Jonah had no desire to see Spiderman, so Cameron walked around the mall with him and Sage while I stood in line with Austin. 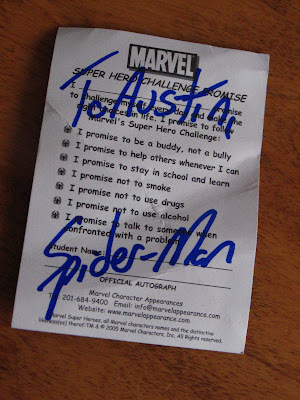 They were so great about posing for pictures and Austin got a signed card from Spiderman. He was quite thrilled. I loved what the card said on the back. 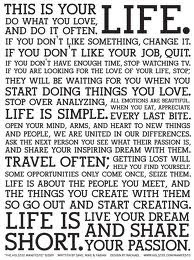 Good rules to live by. Nice to see a superhero promoting them. 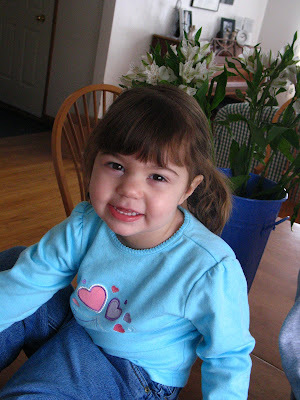 Look who's a big girl! So, this morning, Sage comes up to me with her soother and points out the fact that it has a hole in it. And I thought: "Here's our chance to get rid of it!" So, I suggested because it's broken, that she should put it in the garbage. And she did. 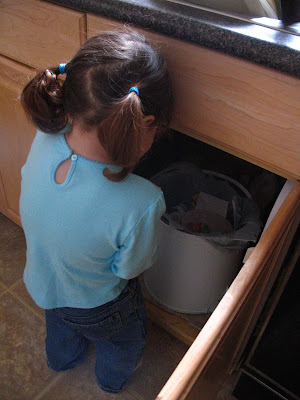 I even got a picture of her putting it in the garbage. What I didn't get pictures of, however, were the tears and drama that followed all morning when she'd ask for her soother. I'd remind her that she put it in the garbage and she'd cry and say: "But I need it! I need my soother!" 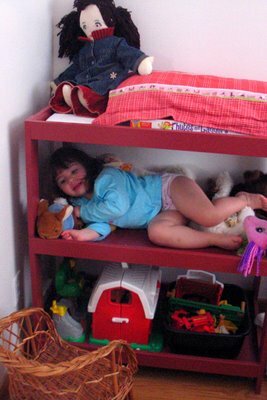 Then, at naptime, when she always uses it to fall asleep, it was a very difficult time. More tears. More drama. More: "I need it! You get it, Mom!" 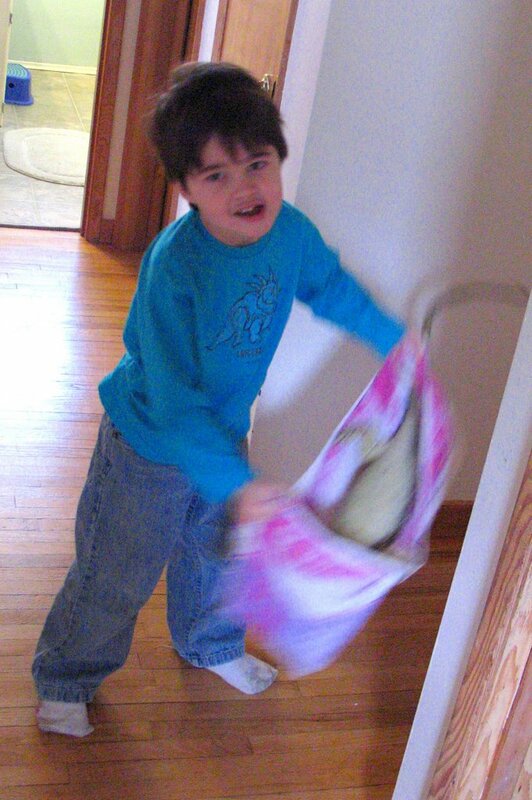 And then she actually snuck out of her room and walked to the kitchen garbage where she was going to try to get it back! I wrapped up the garbage and threw it out. So, it's been a bit of a long day. Nightime routine was minus the crying (thankfully!) but it took her a LONG time to fall asleep. Hopefully it'll get easier after this! We hosted our scrapbooking weekend! We hosted our monthly online crop this weekend at MSS and it was great. Lots of challenges. Lots of fun. Susan came over on Friday night and, after a not-so-quick run to Walmart and the Shoppe, we scrapbooked together until after midnight. On Saturday, I was able to scrapbook in snatches here and there and I just finished up a layout tonight. 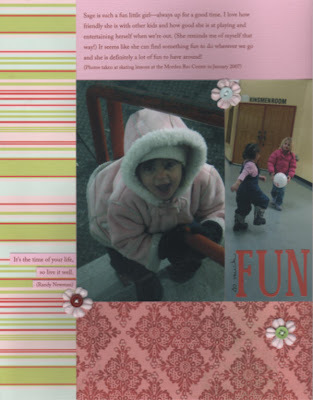 This layout was for the challenge I posted, which was to put a title on your photo. Austin's field trip layout for Liz's challenge to use something you'd normally throw away on a layout (I used the map of the park) and Val's challenge to combine circles and squares. 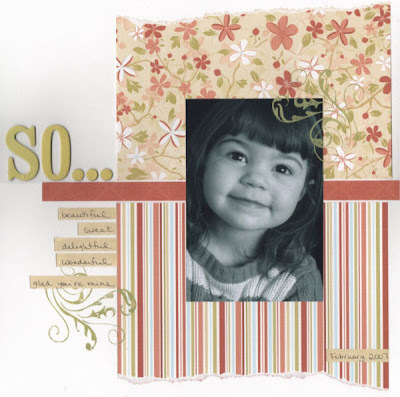 This layout was for the copycat challenge-- I scraplifted a layout from Anita's gallery. And Liz's first challenge was a sketch challenge. I made this layout using her sketch. 2, 3, 4. Three beautiful, healthy children. 5. A warm house that I love. 7. A husband who's willing to make our marriage work. 9. 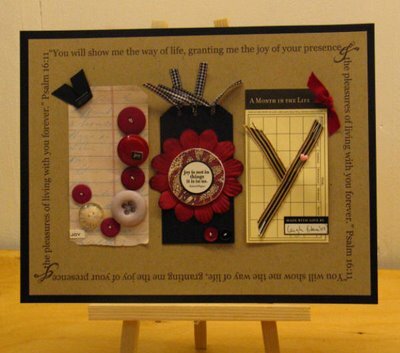 A fun evening planned for tonight with friends, scrapbooking and an online crop at MSS. 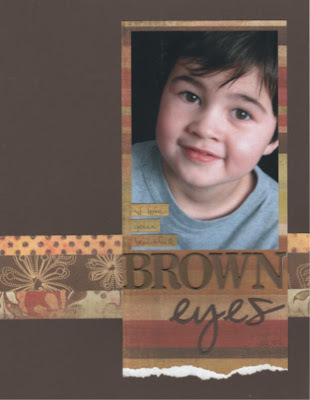 After signing up for the Kid Perspective class at Big Picture Scrapbooking, I thought this would be an interesting way to include some of my kids' perspectives in my albums. 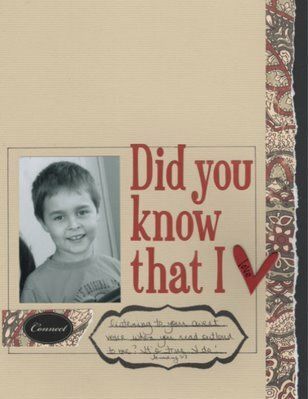 Some of the answers surprised me (like #7-- tag!) but all in all I was pretty pleased with his perspective-- especially where he listed himself twice! 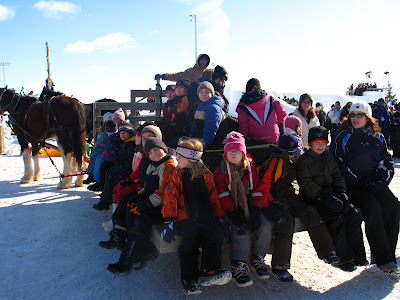 Austin's class went on a field trip to le festival du Voyageur yesterday. And of course, I volunteered to go along. I love going along on his field trips. He has such a great class that I really enjoy connecting with. And I love watching him interact with his friends and take everything in. 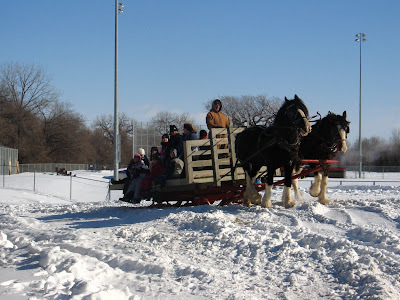 I especially enjoyed going to the Festival du Voyageur park in old St. Boniface yesterday. It totally brought back memories of going there on field trips with my school as a kid. And now, Austin's doing the same thing. Kind of a neat thing to connect on. 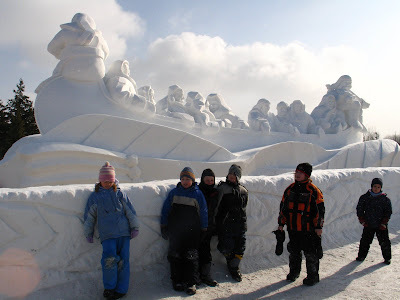 When we got there, we walked around and looked at the ice sculptures which were amazing. 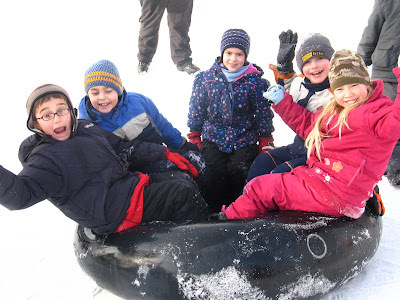 Then we went to the toboggan run where the kids got to slide down the hill on innertubes. After that, we had lunch (we brown bagged it!) Then heard an outdoor presentation about transportation in the time of the voyageurs. This was followed by a horse drawn sleigh ride. 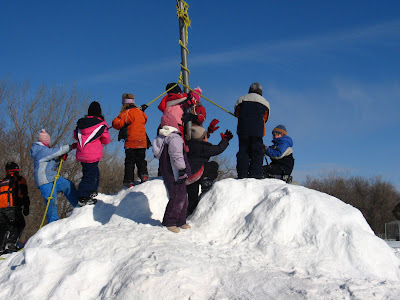 Then, the kids enjoyed playing on a large snowhill with a pole with ropes attached to it sticking out of it. 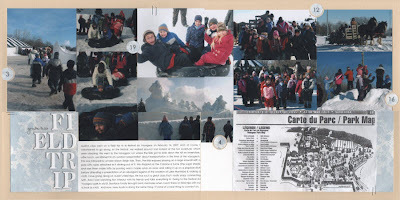 Then we stopped at the Cabane a Sucre (the sugar shack) and saw them make taffy by pouring warm maple syrup on snow and rolling it up on a popsicle stick. This was followed by a presentation of an aboriginal legend of the creation of Lake Manitoba and a craft. After another stop at the washroom, the kids loaded back on to the bus for the ride home to Morden. When I read this, it totally struck a chord with me. I do that. I don't live in the moment enough. It seems as if my mind is always already onto the next thing. 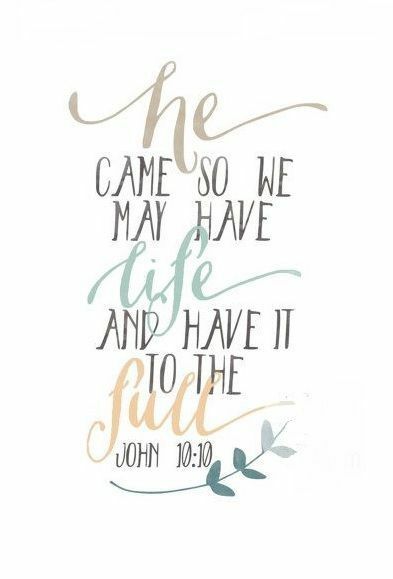 And I was also struck by connecting this quote to my word for the year: joy. I wonder how much more joy I would find in the moment, if I paid more attention to it (really lived in it) and didn't rush it along so much. 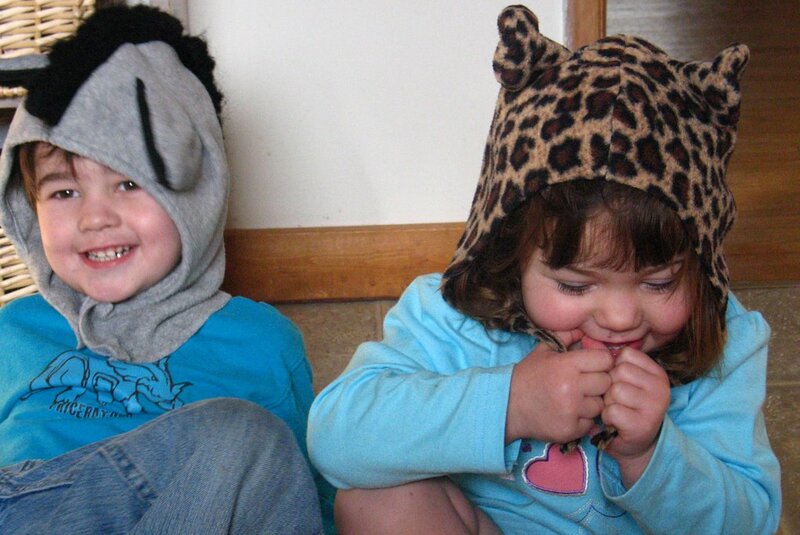 I love being a stay-at-home-mom and getting to enjoy Jonah (4 1/2) and Sage (2 1/2) on a daily basis. Here are a few pictures I took today of things they did that made me smile. 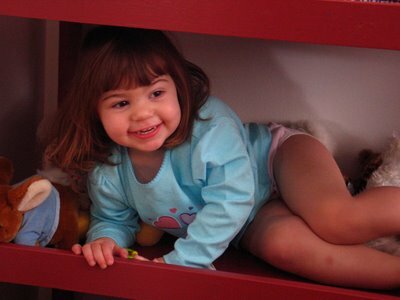 Sage "hiding" in her room on her change table. Jonah and Sage "being animals." 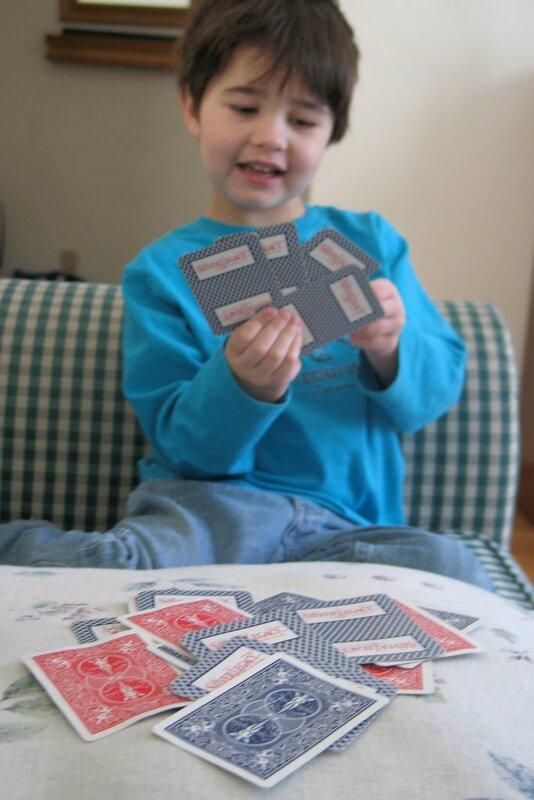 Playing Go Fish with Jonah while Sage napped. 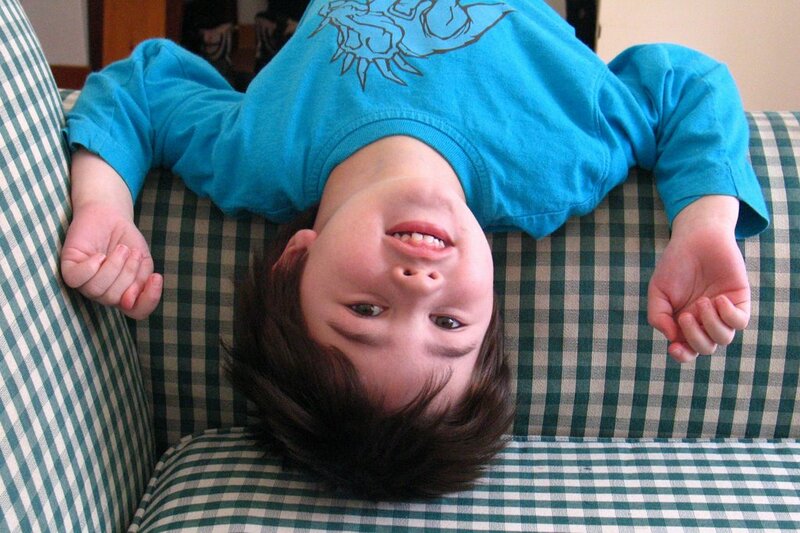 Hope your day is full of smiles, too! In Ali Edward's ezine today, she challenged everyone to come up with their own personal scrapbooking (or creating) manifesto. She gave suggestions to finding it and asked us to answer the question: "why do I create?" 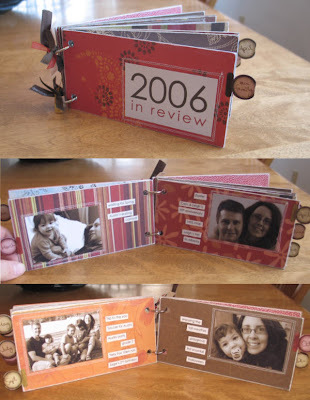 I discovered scrapbooking 4 years ago through my good friend, Anita. 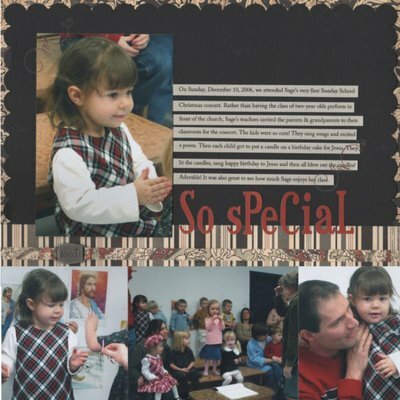 She was selling scrapbooking supplies at the time and when we had Bible study at their house, I loved looking through her albums. I'd think: "I would love to do this." 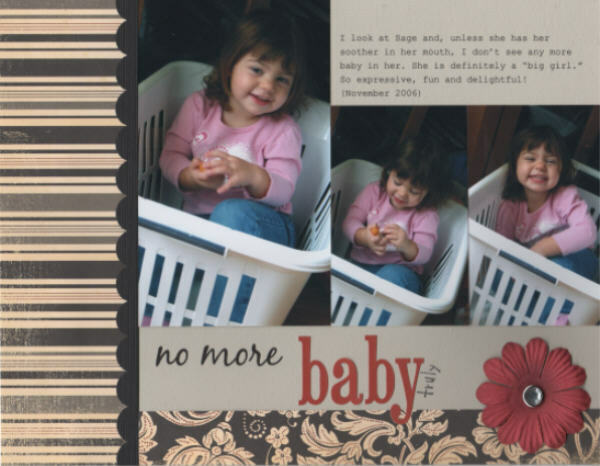 For me, scrapbooking is a lot of things. 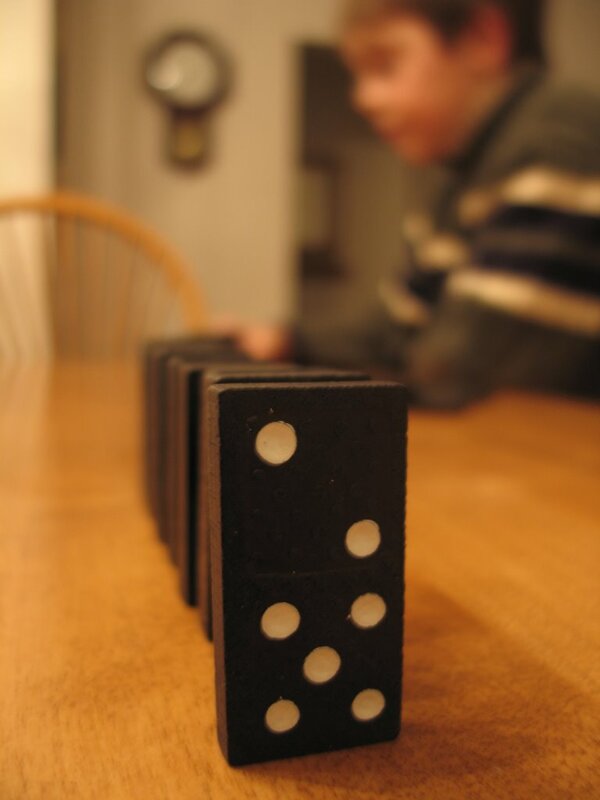 But mostly, I think, it's telling the story behind the photos in a creative and enjoyable way. 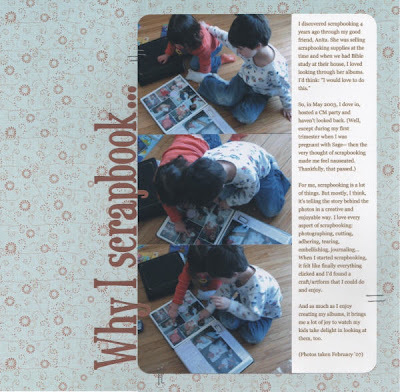 I love every aspect of scrapbooking: photographing, cutting, adhering, tearing, embellishing, journaling... 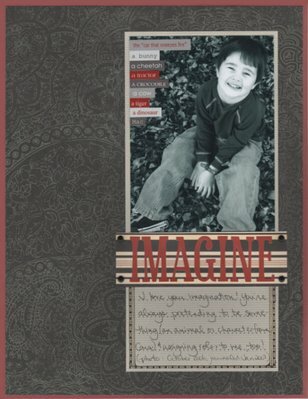 When I started scrapbooking, it felt like finally everything clicked and I'd found a craft/artform that I could do and enjoy. 3. 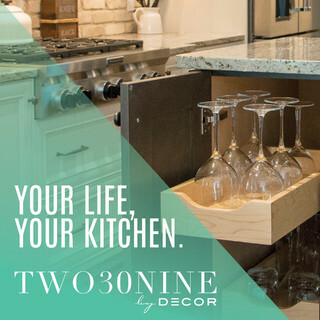 Use your mistakes to make your layout better. That's about it for now, but I might add to this later with a little more thought. Today, was a typical Sunday. Got up. Got myself and the kids ready for church. Our first service starts at 9:30 and this is the one we attend. During second service, Sage and Jonah go to preschool Sunday school (J.A.M.-- Jesus And Me) and Austin and I go to R.O.X. (Radical Over Christ). During both services, Cameron runs the P.A. This morning in R.O.X., our lesson was about prayer. After church, we went through the McDonald's drive-thru and picked up lunch to bring home and eat. After lunch, Sage and Cameron took a nap. Jonah and Austin played on the computer. 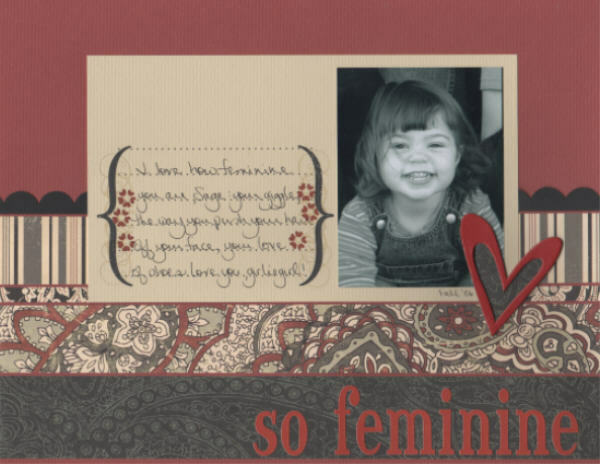 And I made brownies & scrapbooked. After Sage's nap, we watched A Bug's Life on TV. I made waffles for supper. We all hung out together in the living room. 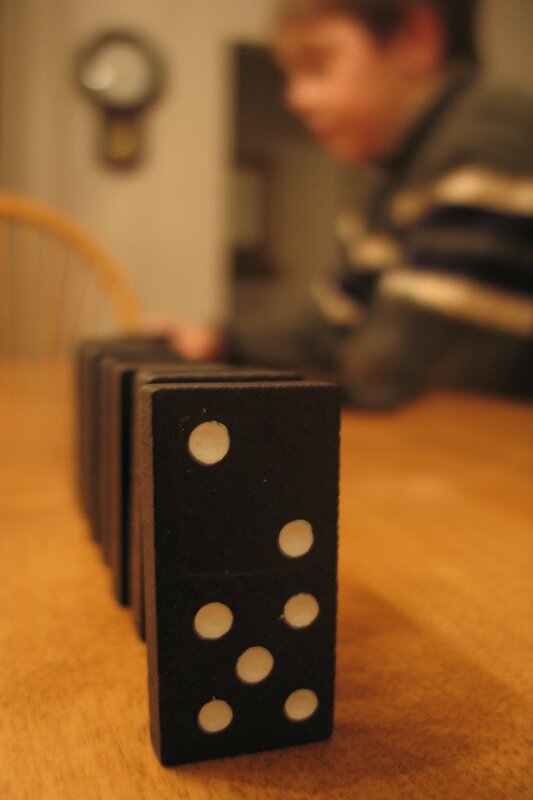 Austin got his dominoes out in the evening and set them up. Unfortunately, Cameron wasn't feeling well, so he went to bed early. Sage and Jonah got baths. We had a snack, read some stories and tucked the kids into bed. Austin stayed up a little later and read to me. Once Austin was in bed, I checked a few items I'm watching on ebay, updated my blog and waited until 10pm to watch Studio 60 on the Sunset Strip. A relaxed, casual Sunday. The best kind of day. I cannot believe that February is already upon us... Wow, January just flew by! And with the arrival of February means that the Design Team at MSS have posted their layouts using the fabulous February kit.